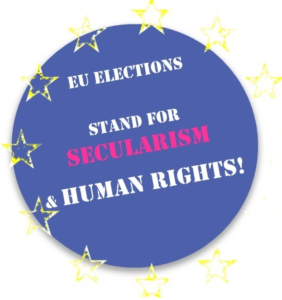 European elections in May 2014 will be crucial for humanists in Europe. The rise of radical populist parties, the persisting societal conservatism in several EU Member States and the extremist religious lobbying at EU level are challenges to the progressive values we defend. In the perspective of coming EU elections, the European Humanist Federation (EHF) believes that the EU should take the following considerations into account for the benefit of all European citizens. EU institutions must remain independent of all religions and beliefs. Individual EU office-holders must assiduously maintain neutrality in their public and official pronouncements and behaviour, whatever their personal beliefs. Every citizen has the right to believe or not, which is a private matter, but it is necessary to ban any religious influence on policies and on the organization of the society itself. Since the implementation of the Lisbon Treaty in 2009, the European institutions are required to conduct “an open, transparent and regular dialogue” with churches and non-confessional organisations. Too often the non-religious have been ignored or given inferior treatment, though an EHF complaint to the EU Ombudsman has produced some improvement recently. Guarantee complete transparency in appointments to expert and ethical committees assisting the working groups of the European institutions. Populist movements have been growing in Europe for more than 20 years and the financial and economic crisis has reinforced the problem. They attack democracy in depth and do not constitute a credible political alternative. They exacerbate social tensions and popular suspicion of democratic processes. They also contribute to the spread of racist, xenophobic and homophobic attitudes which oppose human rights and undermine the European project. Such situation demands a strong and coordinated European answer. Promote European citizenship and the active contribution of citizens to the public decision-making process. Scientific research policy must be free from religious vetoes. Scientific research should be guided only by reason, experimentation and demonstration subject to ethical approval by impartial bodies. Take into account, in its decision process, the criteria of general interest that European research must necessarily involve. The priorities of this research should not be based only on economic criteria. International relations should respect human rights, individual freedoms guaranteed by the state and reject all forms of discrimination including those based on gender, sexual orientation, ethnic origin, religion or beliefs. Defend freedom of expression which includes freedom to criticise religious and philosophical beliefs, and to advocate for the suppression of blasphemy laws in the world.